A powerful demon known as Agrith-Naar is about to be summoned by a group of evil dark wizards. Can you assist Father Reen by killing the demon once and for all? A sinister group of dark wizards is attempting to summon Agrith-Naar, a demon of exceptional mystical power. Rather than try to prevent them, a Saradominist priest asks the player to help summon the demon and then kill it once and for all. Begin by speaking to Father Reen just south of the Al Kharid Bank. Begin the quest by finding Father Reen, who can be found south of the bank in Al Kharid. He's looking for you, and you happily say that you're you. He tells you that the evil wizard Denath has gathered a group of dark wizards and is planning to summon the demon, Agrith Naar. You say you'll stop the summoning, but Reen explains that he wants the summoning to go ahead as planned, but for you to kill Agrith Naar. He tells you to find his friend Father Badden, in Uzer, which is where the summoning is taking place. You can get a ride to Uzer via the magic carpet just outside of Shantay's Pass. Once you arrive at Uzer, head south east into the town and you'll come across Father Badden. He explains that to be able to get the opportunity to kill Agrith Naar you'll have to be there when he is summoned. To be there, you'll need to infiltrate the group. Head into the dungeon to Badden's east. Going north through the dungeon will take you to Evil Dave, who is guarding the portal. Explain that you want to join their group, and if you're wearing 3 pieces of black items then he'll let you in. If not, he'll declare you not evil enough and you'll need to find an evil costume. You'll also need to dye Silverlight black. To do that, there are a few mushrooms near the entrance to the dungeon. Pick a mushroom and use it on your mortar and pestle, then use the black mushroom ink on Silverlight to turn it black. You can also dye your desert robes black for the evil costume. Once Evil Dave accepts you into the crew, there will be a cutscene and you'll be introduced to Denath. He tells you an incantation you'll need to remember (write this down as it's random for each player) and that you'll need a demonic sigil, of which the mould for can be provided by Jennifer, one of the apprentices. 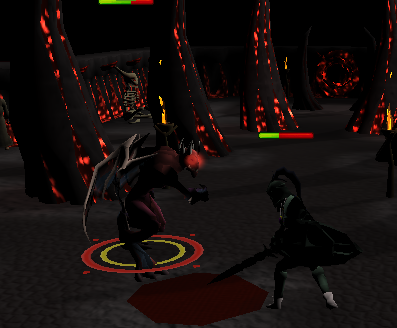 Teleport to the Duel Arena, and with a silver bar go to the furnace and make a Demonic Sigil. 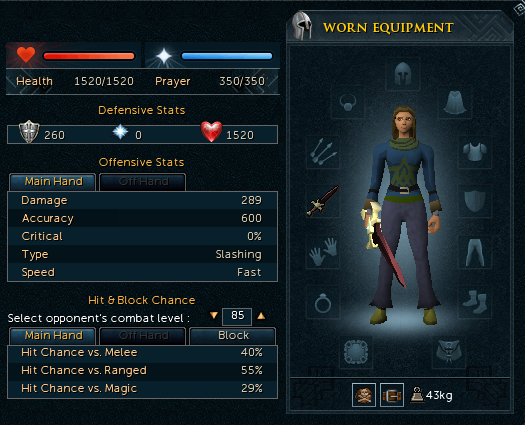 Now's your chance to bank anything valuable and gear up for the fight with Agrith Naar. Note: You no longer need your evil costume to get into the portal. When you get back, talk to Matthew. He explains that he and Josef were interested in how the magic worked, so Josef stole a book Denath had. After reading it Josef ran out and disappeared with the book. He explains that Josef wouldn't have gotten far in the desert, so he must have hidden it somewhere. Head through the portal and out of the dungeon and speak to the Golem wondering around. He tells you that he saw Josef hide the book in one of the broken kilns before Denath came out and killed him. Search through the kilns until you find a Demonic tome. Read it and you'll find out Agrith Naar was actually summoned a long time ago because he was less powerful on this realm than on his own. You'll also find out that the incantation to summon him is backwards to what Denath told you. Show this to Matthew and he's puzzled. Before you get any further, it appears Denath is ready to summon Agrith Naar. After completing the ceremony, Denath steps into the circle and disappears. Apparently saying the summoning ritual backwards 'desummoned' Denath (who is actually Agrith Naar!). A few of the apprentices run out. Follow them and when you leave the portal you'll see Tanya killed by 3 ghosts. Take her sigil and while you're there, take the strange implement in the north west corner of the room. In the middle of the room is Evil Dave standing next to Eric's body. Tell Evil Dave to head back through the portal, and he'll give you Eric's sigil before heading back. Talk to Father Badden and Reen and explain to them that you'll need their help resummoning Agrith Naar. They'll disappear into the dungeon. Talk to the Golem and he'll explain that he can't help because of his programming. Use the strange implement on him and you'll take out the scroll stopping him from helping. Talk to him again and he'll disappear into the dungeon. Go back through the portal and speak to Matthew. You'll start the summoning ritual. This time you need to recite your incantation backwards. When Agrith Naar is summoned he'll kill Matthew. You tell him that it was actually you who summoned him and the fight will start. You don't have to use Silverlight the whole time, but make sure you use it for the final blow. Agrith Naar is a level 84 enemy with no listed weakness. He attacks with Magic and Melee. Unless you are a low level, he's not too hard to kill and you'll be able to finish him in no time. When you kill him, his ichor will fuse with Silverlight to create a more powerful sword called Darklight, which offers you experience in a combat skill. 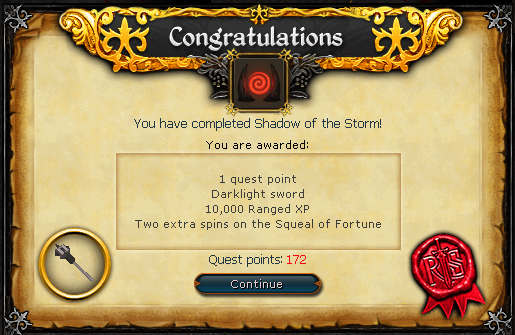 Once you've made your choice, quest complete!